My day to day morning rituals as a child were difficult, mostly because I didn’t like cereal; both my sister and I hated cereal growing up. Why did we hate cereal? That question is complicated and kind of hard to answer. For me, it was mostly because of the texture. I hated soggy things, absolutely loathed them. Now, it’s not so bad; after moving out on my own and getting a much broader perspective on life and the things around me, I decided that maybe eating soggy food wasn’t the worst thing in the world. I finally understood what I needed to do, to stop these tyrannical children. Why are they teasing him, what has he done to warrant this kind of reaction? I’ve never forgotten this video and have always wondered, “Is Carlton right?” It seems senseless to me,; the rabbit is on the box of the cereal, yet these so called “kids” won’t let him have even a single bite of it. Granted, he’s not missing much; I’ve had it before, and it is not that impressive. Even though it is not a good cereal brand, he still deserves to eat his fill. Why prolong this poor rabbit’s torture? He spends his money and his time to eat some of this cereal, yet there is always a little brat who feels that it’s necessary to steal it from him and upset him time and time again. Not only is just wrong normally, but to add to the sorrow, he’s the mascot! He is the face of the brand, and all he gets is poking and prodding. You could argue that since he is a rabbit, the kids are just trying to protect him from something that would hurt him, but he is not a normal rabbit. He is a walking, talking, sentient anthropomorphic rabbit/man creature hybrid. He can make his own decisions, he doesn’t need a group of snot-nosed kids to tease him and cause him duress. 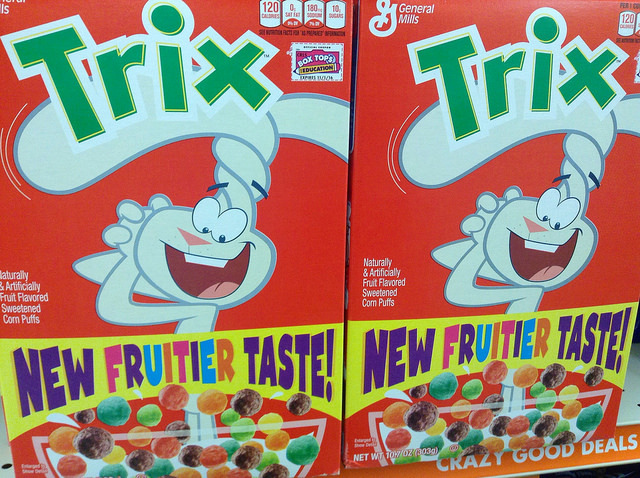 My answer to you is to not do unto others as the Trix Kids have done unto the rabbit. Treat your neighbors with love and respect, and above all, please don’t dangle their food right above their heads, where it is just out of reach. Let them in, show them love and you will grow in everything you do. Danny Smith Is Trix just for Kids?